Finding a web hosting nowadays could be a daunting task with the sheer number of hosting companies available; may it be local or international. With many different features and low prices, it easy to get fizzed over the numerous options available. Selecting a hosting site used to be easy, you find the hosting features suitable for intended use; blog, application, ftp, file sharing and etc. But nowadays, almost all hosting sites support those features; so now it boils down to reliability, bandwidth and ease of use. 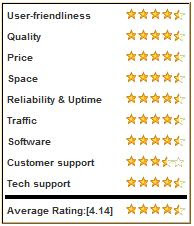 So what better way to find a webhosting rating and actual user reviews than at Web Hosting Geeks. It packs with loads of information on website hosting reviews, ranking and ratings. Apart from from the reviews and rating, Web Hosting Geeks also awards web hosting services companies by category, for example; Best Budget Hosting, Best Blog Hosting, Best Ecommerce Hosting and many more which makes easier to select the right hosting company. Having said all that, I think Web Hosting Geeks is the best website to do research if you're intending to look for a hosting service. I'm certainly looking forward to find a cheap web hosting service to host files and photos for my blog. Head over to Web Hosting Geeks to find out which hosting service suits you. Few months back I've treat myself with a gaming apparatus, Logitech Momo Force Feedback Wheel. Its an excuse for me to unwind and relax from work plus as a reward for milestones archived. It's not an easy task to select this wheel as it quite old (long in market, since Windows 98) and there's a stream of incompatibilities discussions with Windows Vista in forums. Safe to estimate that 50% says it doesn't work and 50% said it works. Anyhow determined, I've boldly bought it with Collin McRae Dirt. Exited, I've downloaded the latest driver and installed the game; hoping for instant action. Boy I was in a bind when I've discovered that the gas paddle was stuck all the way (full throttle) in the game. I've kept reinstalling the drivers, applying patches to the game but without avail till I've found a registry hack in Logitech's forum. The registry hack was meant for something else, but heck I was desperate and willing to try anything to make it work. And guess what it does works :D I've finally had a proper go 3 hours after when I've initially started. The steering force feedback was was awesome and it feels and looks great. Paired with the realistic game of Dirt, I've was totally immense within the game. Another note though for Windows Vista users, you also have to download the latest Collin McRae Dirt patch v1.2. There a vital fix which you require to load your saved gaming profile properly. 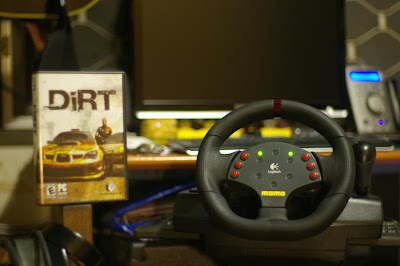 So there you go, if you're into driving simulation; the Logitech Momo is a great choice, plenty of fun, inexpensive (RM238) and it WORKS with Windows Vista. Collin McRae Dirt goes for RM119. Being out on a vacation is so much fun and something I always look forward to. It’s the time to really let loose and be care free about all my worries. It is also a time to see other places, food and culture, plus there’s senseless shopping to boot. However, a vacation would be more meaningful if you got your friends or family tagged along to share with. Recalling a particular vacation or shall I say a business trip in east coast of Malaysia, me and a couple of colleagues were driving along the old road heading towards Mersing. It was a long winding drive, approximately 4-5 hours through forests and plantations fields. I would be very tired at the end of the trip if it weren’t for my cheerful colleagues. We’ve shared stories, jokes all along the way and also noticed some unusual signage. What I’ve discovered was a road sign with a cow on it crossed, meaning no cows on the road. Computing the signage; it is normal if the sign was no motorcycle or lorry, whereby logically behind the wheel is a person who can READ the road sign. But if this road sign was intended for a cow? *blink*blink* Wow!! That the cow must be really smart to understand, or was it a cow who put it up in the first place. Hahaha..I was giggling on my own, when I’ve explained to the others we all break into laughter. Oh well this could be the most humorous trip of all. With the right attitude and companions, a business trip could also be a mini-vacation. I really that break after a stressful couple of months at the office. A holiday however requires proper planning and budget. I do most of my planning through online travel guides, books and friends. I also subscribe to travel e-newsletter for periodical updates. As with my previous experience to Britain, Scotland, Indonesia, Singapore and Thailand; proper planning will ensure a good trip. As for now, a vacation to go on Las Vegas tour during CES (Consumer Electronic Show) or a trip to Japan tops of my dream holidays. Planning your next vacation? Looking for ideas on what to do? Sign up for the Trusted Travels eNewsletter and enter to win a $150 Magellan’s Gift Certificate - Offer ends August 31st, 2008. Who knows, you might end up with Knotts berry farm tickets from the splurge of the moment.